Last, but certainly not least, is most definitely my favorite of the 3 soups. I made this the other night to take some pictures for this post so my husband and I ate it for dinner. We both kept commenting on how good it really is, almost as if it's crazy that these ingredients make this much awesomeness! For those of you asking, "what is fennel", I will give you the low down. Fennel is a whitish bulb with greenish stalks coming from it, as seen in the picture below. It is crunchy and a little sweet and smells like licorice. It is in the same family as carrots, parsley, dill and coriander. Fennel is a good source of vitamin C, fiber, potassium, phosphorus and folate. It also contributes some iron, magnesium, calcium and niacin. I first had this soup at a dinner party with some great friends. Our friend, Annie, said she was going to bring a carrot soup to have with dinner that night. Seriously? Carrot soup? Cue eye roll. Let's just say I was less than excited to try, let alone eat, carrot soup with dinner. I admit wholeheartedly that I was way too quick to judge the soup by its title. I should also never doubt her taste in food (or wine!). It was delicious and I knew it was a recipe I needed. So, I found a similar recipe and have adapted it a bit, which is what I'll give you today. Trust me, don't judge this soup by the title! I've made this soup as a first course for Thanksgiving, to go with pizza for a family gathering and for an easy weeknight meal. The color is absolutely gorgeous and it's fancy enough to wow dinner guests or to have with your holiday meal. The flavors work so well together and the creaminess is so rich and satisfying. 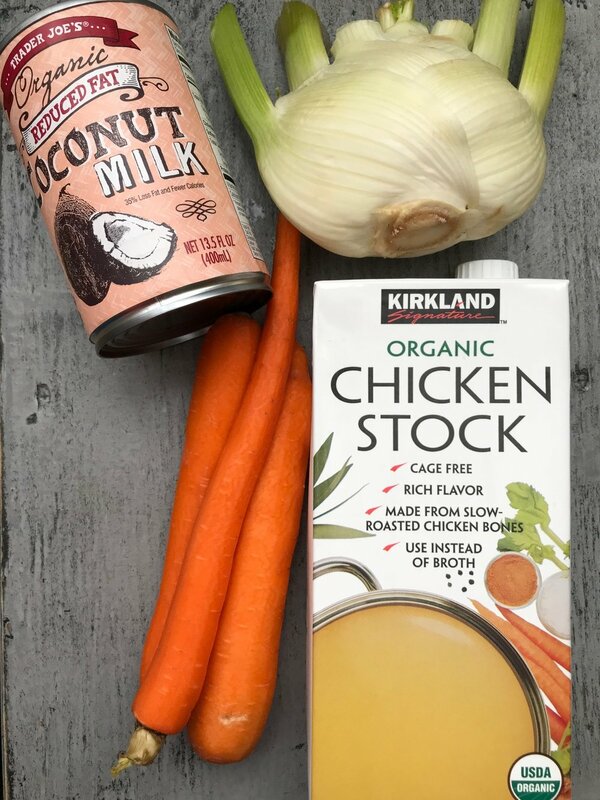 This can also easily be a vegetarian/vegan recipe by using vegetable broth instead of chicken. In large sauce pot bring carrots, fennel, garlic and broth to a boil. Reduce heat and simmer for 20 minutes to soften vegetables. Add coconut milk and simmer for 10 more minutes. Using an immersion blender, puree soup until smooth. Alternatively you can blend veggies with some of the liquid in a blender until smooth. I truly hope you will give this delicious soup a try. I think it will knock your socks off! This is a soup that can take your dinner party, holiday meal or even your weeknight dinner to the next level.